UPDATED: This post was updated in October 2015 to add in a second image and even more tips. 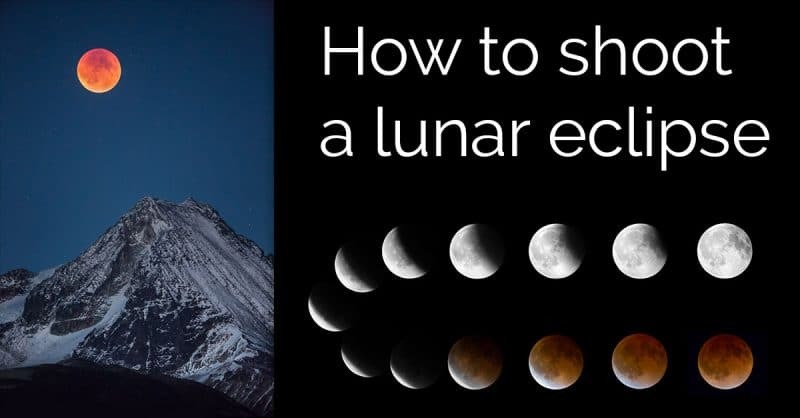 Continuing my “Creating The Image” series of in-depth posts about specific images, I thought we’d take a look at shooting at how to photograph a lunar eclipse. 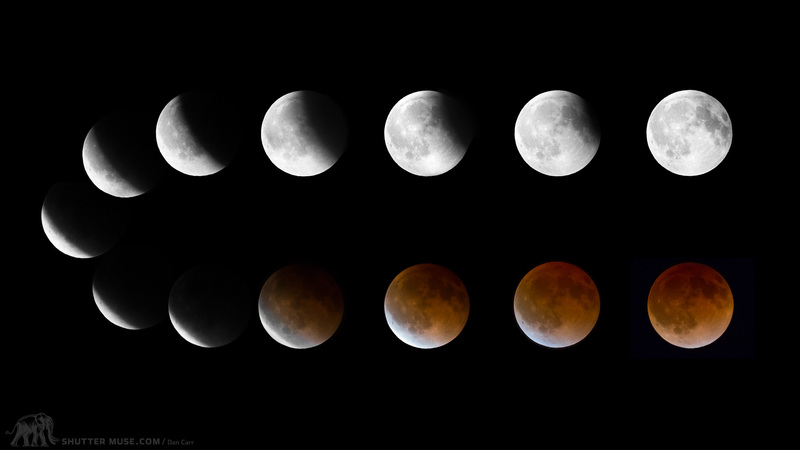 For this particular post, I’m actually going to walk you through the creation of two different lunar eclipse images that deliver very different end results. At the time of writing this at least, these are actually the only two lunar eclipses I’ve ever shot, but I’m extremely pleased with the results. The second image that I’ll talk about even went viral all over the internet and was featured on national news in the USA. I learned a heck of a lot shooting these two images, and I did a lot of research to make sure I came away with the right results from these two rare events. You really don’t want to get it wrong because the perfect setup might not come along for many more years. Case in point, the moon+ mountain shot will not happen in that same way for another 18 years! Hopefully you guys can learn from these shots, and learn from some of my mistakes to make sure you get the perfect results next time this lunar event happens to come to your corner of the globe! We’ll go through what equipment I used, what settings I needed to shoot at and how I put the image sequence shot together in Photoshop. In fact I’m going to share a couple of ways to do it in Photoshop, one quick method and then the one I used which was a bit more involved, but ultimately produces a better result in my opinion. 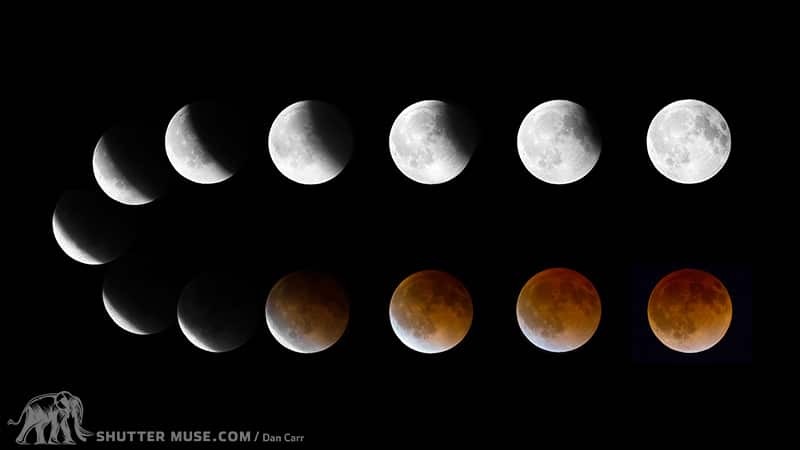 This particular eclipse in April 2014 was the first of a tetrad of eclipses which means 4 consecutive total lunar eclipses, without a partial eclipse in between them. Tetrads are quite rare but they aren’t evenly spread throughout history due to the change in the Earth’s orbit. This century there will be 8 tetrads, though from 1582-1908 there wasn’t a single one. This example is a so-called ‘blood moon’ but of course the tips and tutorial are also relevant for any other kind of lunar event that you might want to be shooting. NASA best described the blood moon phenomenon, when the earth, sun and moon fall into perfect alignment, as if someone standing on the moon was “seeing every sunrise and every sunset in the world, all of them, all at once.” At this point, from the moon the earth would appear as a dark silhouette with a bright red ring around its circumference as it completely blocks the sun. The light from that red ring is cast upon the moon and turns it this incredible shade of dark orange. Yes You’re Going To Need A Pretty Long Lens…..
Let’s get this out of the way first because I don’t want to rain on anyone’s parade later on. To get descent moon photos you’re going to need a pretty long lens. I used the Canon 200-400 with the internal 1.4x extender engaged AND an external 1.4X extender. That gave me a 35mm equivalent focal length of 784mm and even then, the moon was only a small fraction of the actual image. This image shows you that on a full frame camera (Canon 5D Mark III), even at 784mm, the moon is still just a small portion of the image. Now many of you will have an APS-C censor camera and that will give you 1.6X multiplication on your focal length but that would still mean you have to start with a 490mm focal length to get the same size as you see in the image above. In reality, this is plenty big enough for creating a sequence of the moons activity but probably not enough if you were just trying to create a detailed image of the moon on its own. 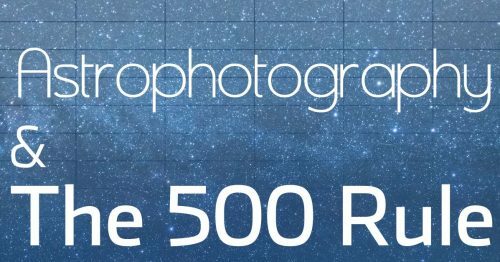 For satisfactory results you are going to want something in the 300mm-400mm range and if you want really great results start looking at 600mm and upwards. Something like a 100-400 or a 70-200 with extenders would be a good starting point. Once you start using a long lens it becomes much harder to keep the camera steady at low shutter speeds as well so you’ll need a solid tripod. If you have a tripod which has an extending column at the top of it, DO NOT extend the column. It adds instability and you wont benefit from having the camera 6 inches closer to the moon! I used a gimbal head with my long lens but since the subject was barely moving I probably could have gotten the same results with a regular (but very strong) ballhead. To get the exposure correct, I highly recommend using the histogram and the flashing highlights option on your camera. When you peer at your camera’s LCD screen in the dark, everything appears to be much brighter than it actually is. Don’t get fooled! 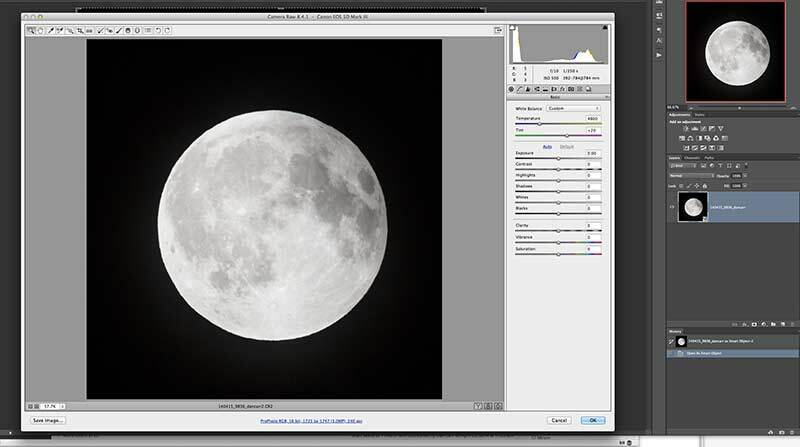 Go by the histogram and make sure you capture as much of the moons light as you can without blowing out the highlights. As the moon goes through the eclipse cycle your exposure is going to need to change quite often so make sure that you are continually checking your results. The single shot above was captured at ISO500 , f10, 1/250 and this was the absolute brightest point in the cycle. My lens could open up to f/8 is I needed it to, but I’m confident in the cameras ISO performance at ISO500, and I prefer to stop down just a touch to gain a little more sharpness and contrast. This bright point in the cycle is pretty easy to shoot but as the moon enters the earth’s shadow and starts to pick up the red glow, it really starts to get difficult and you need to be prepared. Seen through a longer lens, the moon will actually track across your image pretty quickly and you’ll need to make constant adjustments. In fact it’s easy to find yourself shooting a shutter speed that gives you motion blur in the moon when you look closely, so make sure you are inspecting your images at 100% after you’ve shot them. The limit of shutter speed at which you can shoot and have no motion blur is dependent on the focal length you are using so I can’t give a hard and fast number. With my setup though, my results were unsatisfactory once I dipped down slower than 1/2.5 (0.4 seconds) of a second. My exposure for the “blood” parts of the cycle were therefore in the region of ISO5000, f/8, 1/2.5. 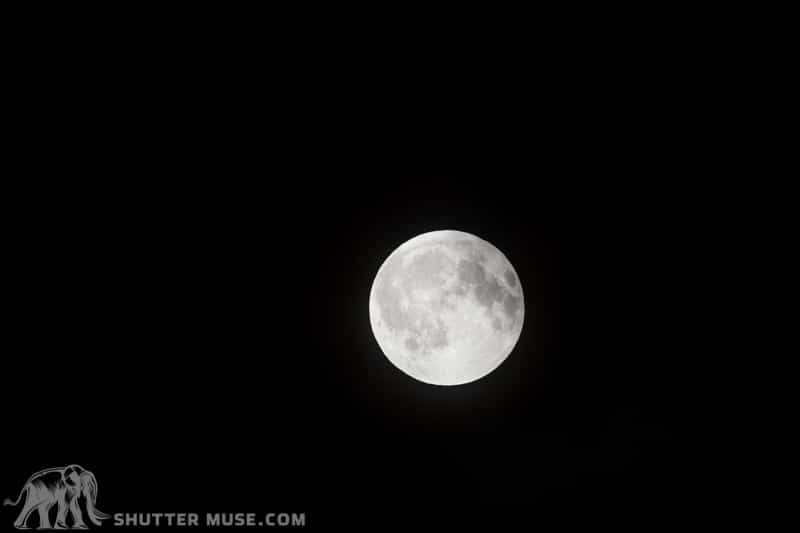 That is a HUGE difference from the exposure of the moon when it’s not in the earth’s shadow so you need to be aware of this and be familiar with the high ISO quality of your camera. You’re going to need to make some trade-offs between ISO and shutter speed because most people will just have to leave the aperture wide open at this point. In order to get satisfactory results at this kind of shutter speed and focal length I also found it necessary to shoot using the timer option. With the shutter button pressed, this then gave a 10 second pause before the image was taken. In this ten second period I would take my hand off the camera as gently as possible and let all of the vibrations in the system dampen themselves out. I found that this made a big difference when shooting the darkest part of the cycle. In terms of getting your focus locked in perfectly, the best option as is nearly always the case, is to use liveview at 100% and then focus manually. If you are not comfortable with this then you can use a single AF point and place it right on the edge of the moon where the contrast is greatest. Compared to some of the other technicalities though, I didn’t find achieving focus to be too difficult. One more thing on the shooting side of things…. don’t underestimate how cold you can get when you stand outside for 4 hours! Take plenty of extra layers as well as food and water. Staying fed and warm will keep your photography senses sharpened! As I explained in the video, there’s a couple of ways to do this. The first method, which is slightly quicker, will probably be just fine for 95% of people looking to create an image like this. The second method is a bit more time consuming but it does give you ultimate control over the end quality of the image. I’ll run through them both here and you can choose which one suits you. I’m going to assume that you are using Adobe Lightroom, but if you aren’t and you want to load the images directly into Photoshop then please watch the video where I show you this method as well. 1. Choose your images in Lightroom and perform all the necessary adjustments that you need to like exposure, contrast and clarity. With higher ISO images, don’t forget to perform your noise reduction at this point and add any additional sharpening that might be necessary. 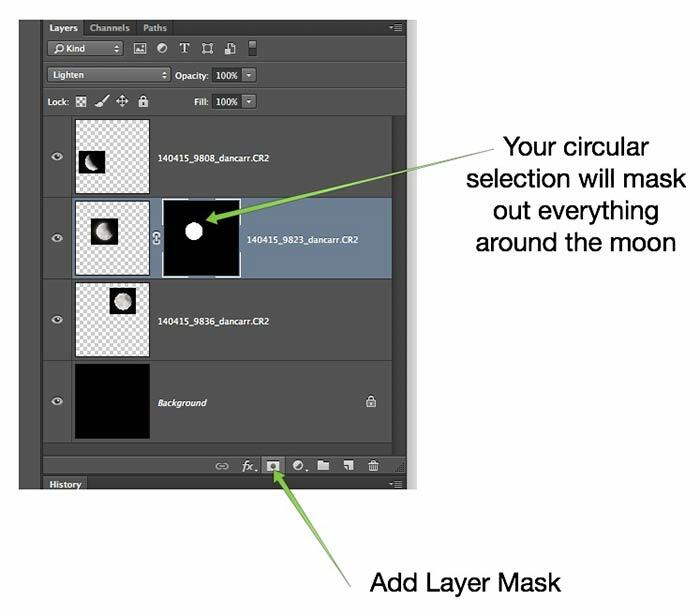 Crop the images into a square around the moon and select all of the images that you want to use in your sequence. 2. Right-click on one of the selected images, go to “Edit In” and then choose the bottom option which says “Open as Layers in Photoshop”. 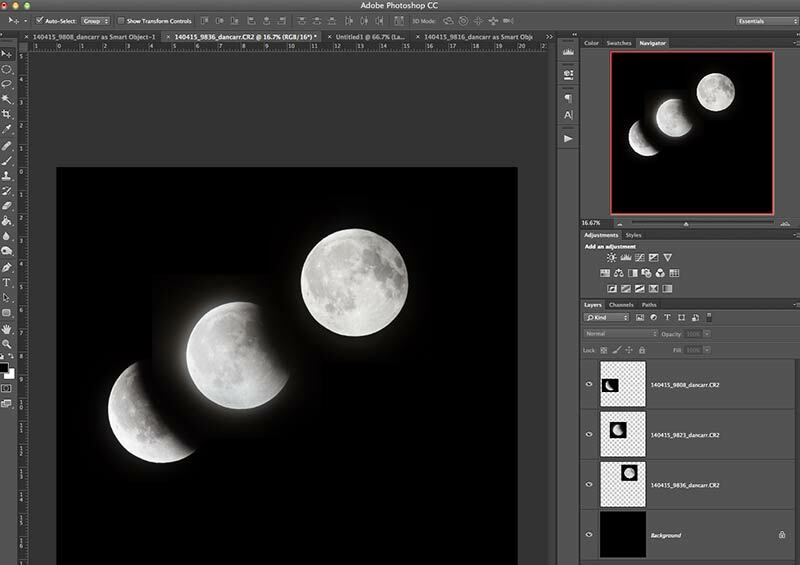 This will open Photoshop and create a new document where each individual moon is on its own layer. 3. Click on the add new layer button in the layer palette and drag that layer to the bottom of your stack. 4. With this new layer selected, go to “layer” in the main menu, then go to “new” and choose the option “Layer from background” to turn this new layer into your background layer. 5. Grab the pain bucket tool and fill the background layer with pure black. This will become our night sky. 6. We need a much bigger canvas to work on so the next step is to expand the current one by going to the “Image” section of the main menu and then down to “Canvas size”. Change your canvas dimensions to something much bigger. You can always expand again later, or crop off any unused portion so don’t worry too much about the size you select just as long as it seems much bigger. 7. 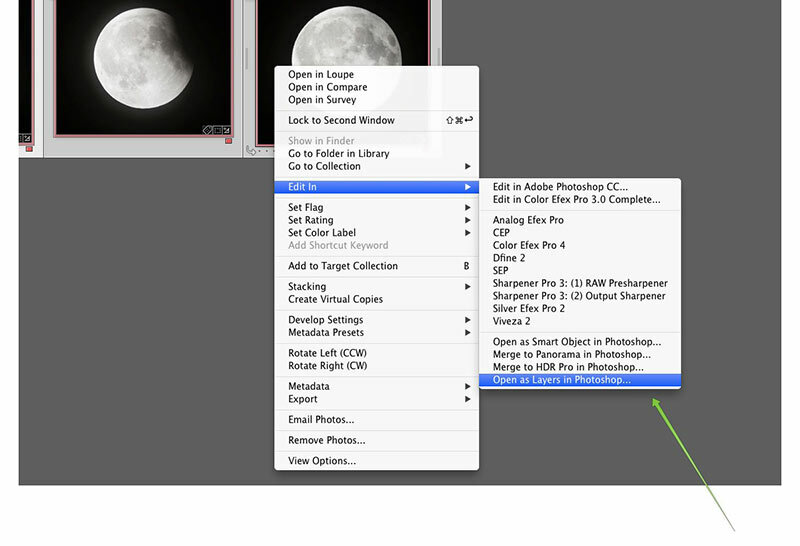 Hit the V key to get your pointer and drag your various moon images around into a rough sequence. 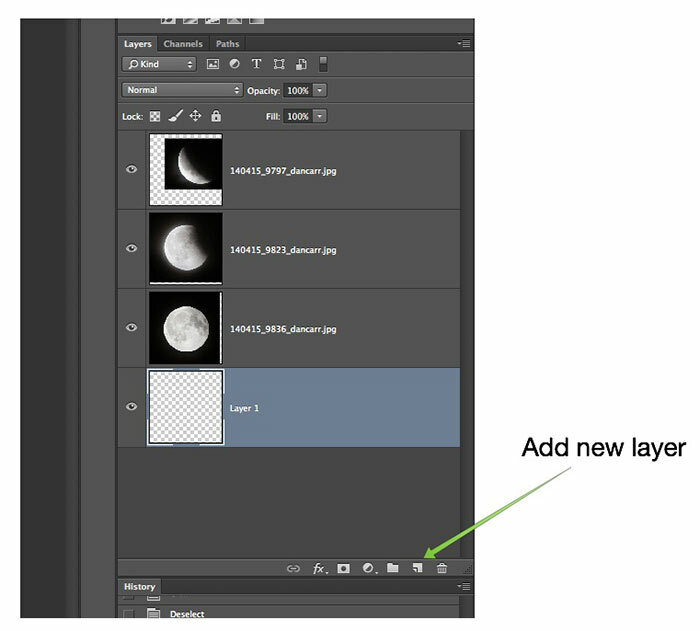 Then select all of your layers in the layer palette and change the layer blend mode to “Lighten”. 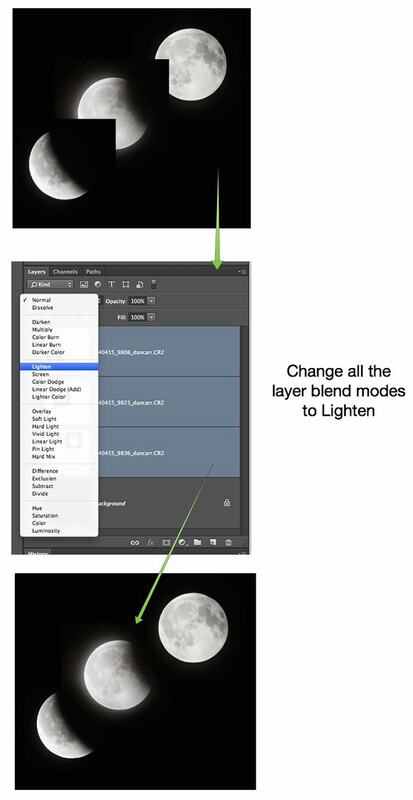 This will change the blend mode of all layers and will allow you to put your moons closer together while you rough out the design for your sequence. 8. Use the circular selection tool whilst holding the shift key to draw a circle around the first moon in your sequence. Try to get the selection as close to the edge of the moon as possible. You can refine your selection by going to “Select” in the main menu, then “Modify” and choose either “expand” or “contract”. When you are happy with your selection, make sure you have that layer selected in the layers palette and click the “Add layer mask” button. 9. 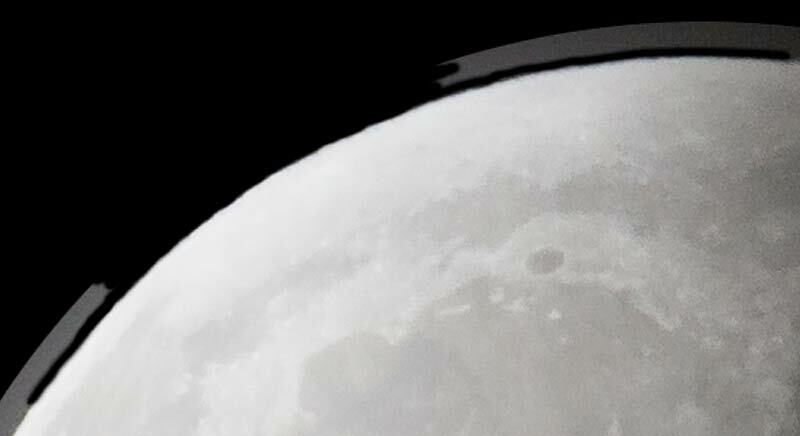 Zoom right in to this first moon in your sequence (300% or more) and grab the brush tool (B key) with the color set to black, being sure that you have the layer mask selected for that layer and not the actual image itself. Brush carefully around the edge of the moon to mask off the rest of the unwanted sky. 10. Repeat this process for all your other moons, then finalize your design. Note that some steps in Method#2 are the same as in #1. Where this is the case, I have not included the screenshot diagrams a second time. 1. Choose your images in Lightroom, but this time right-click on just the first image, go to “Edit in” and choose “Open as Smart Object in Photoshop”. 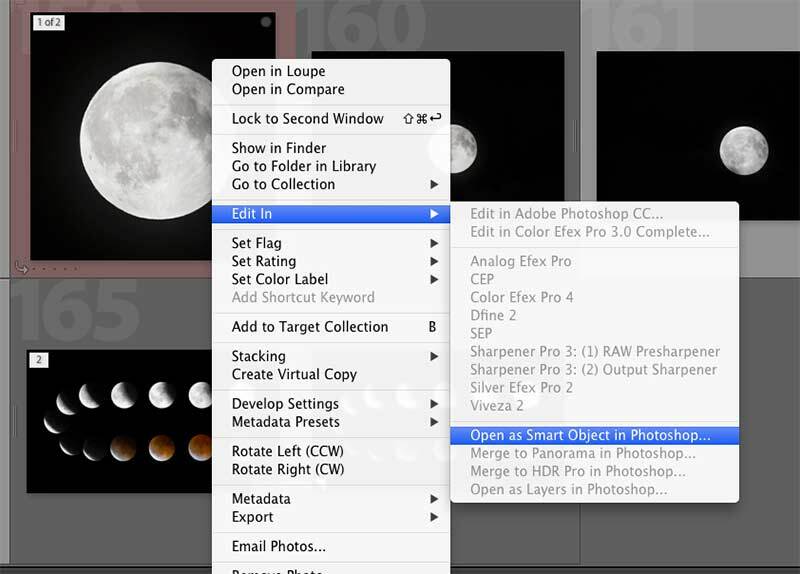 The image will open in Photoshop but you are still maintaining the ability to modify the RAW files in Adobe Camera Raw. 2. In Lightroom, select the second image in your sequence and perform the same action. Once this image is open, right click on the layer in the layers palette and choose the “Duplicate Layers” option. When the box pops up, under “Destination” you need to drop open the options and choose the file name of the FIRST image that you loaded as a smart object. 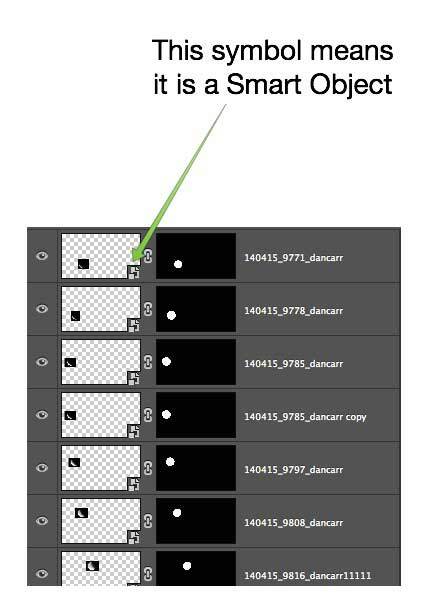 This will copy this second smart object into the first one as a new layer. 3. Repeat this process for all of your images and you’ll end up with one single file that contains all of your smart objects. 4. Click on the add new layer button in the layer palette and drag that layer to the bottom of your stack. 5. With this new layer selected, go to “layer” in the main menu, then go to “new” and choose the option “Layer from background” to turn this new layer into your background layer. 8. Here is the really cool part of this second method, and why it’s worth the extra time if you ask me….. You can now double click any layer in the layer palette to open that image in Adobe Camera Raw and make the necessary adjustments. This means that you are seeing all the images side-by-side just as they will be in the final sequence. 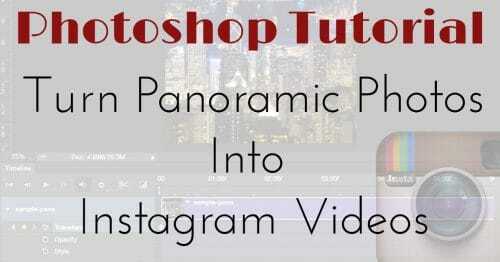 It’s much easier to match their looks and choose the overall style of your image when you can edit them in this way. If one image looks a little off from all the rest, just double click it, edit in Camera Raw and then save it and the change will be passed back into the Photoshop document. This is the best non-destructive way to work with this kind of image and you can perform these edits at any point in the process. 9. Use the circular selection tool whilst holding the shift key to draw a circle around the first moon in your sequence. Try to get the selection as close to the edge of the moon as possible. You can refine your selection by going to “Select” in the main menu, then “Modify” and choose either “expand” or “contract”. When you are happy with your selection, make sure you have that layer selected in the layers palette and click the “Add layer mask” button. 10. Zoom right in to this first moon in your sequence and grab the brush tool (B key) with the color set to black, being sure that you have the layer mask selected for that layer and not the actual image itself. Brush carefully around the edge of the moon to mask off the rest of the unwanted sky. 11. Repeat this process for all your other moons, then finalize your design. The great thing about the method I have outlined here is that once you have it all completed you can easily drag the moons around into different positions. Obviously my image takes a pretty artistic approach to displaying the moon’s actual orbital path that night, but for me it worked aesthetically to display this number of images. You could try an arc, a circle or a diagonal line, all within just a few minutes until you find a solution that works for your sequence. The moon transition sequence is a nice trick, but you may also want to consider this second type of image where the moon is grounded in a specific location. If you happen to live in a place that’s often photographed and has distinctive features, then there’s even more reason to take this second option. I live in the resort town of Whistler, British Columbia, home of the 2010 Winter Olympics. We have several recognizable features around the town, including mountains and man-made objects like the Olympic Rings. 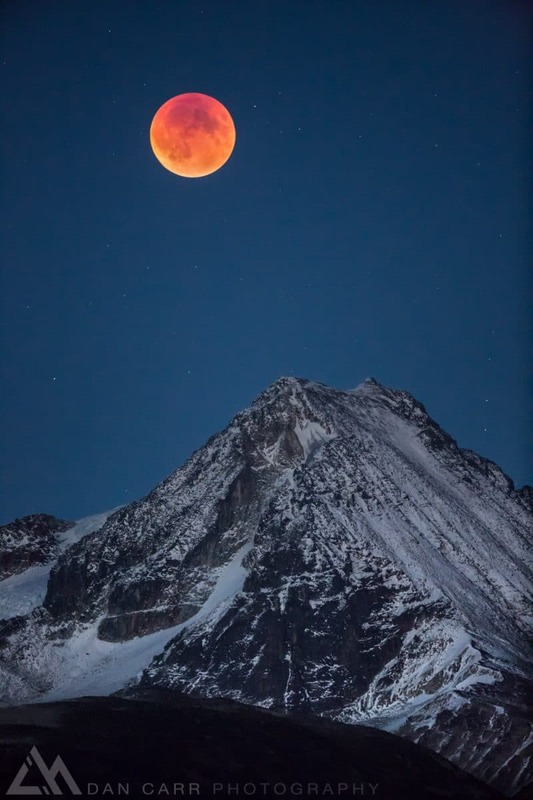 In October 2015, another Blood Moon occurred, and this time it coincided with a Super Moon as well, the point at which the Moon is closest to Earth, causing it to appear slightly larger in the sky. This “Super Blood Moon” is quite rare, and will not take place again for another 18 years after the 2015 occurrence. Since this was a rare event, I spent some considerable time looking at various options for the image and in particular, using the PhotoPills iOS app to show me the Moon’s position on the day of the eclipse. I determined that the best option for me would be to work with Wedge Mountain, one of our famous distinctive local peaks. The hardest part was determining how high I would need to climb up the mountain on the opposite side of the valley. I did not want to point of total eclipse to appear to happen to soon or too late in the image, and controlling my altitude allowed me to position it correctly, with relation to the peak of Wedge Mountain. For these shots I used identical equipment to the previous image, although I only used the 200-400 at around the 300mm range this time. The next consideration was really all down to shutter speed. When the moon is low in the sky like this, it moves pretty quickly. You can easily see the movement in your viewfinder. From previous moon shoots, I knew I needed to maintain a fairly decent shutter speed in order not to blur all the crater detail on the Moon’s surface. I also wanted to give myself enough time to try several compositions and focal lengths. Whilst the ultimate image sharpness would have come from using the 10-second timer with mirror lockup function, this would have severely limited the number of images I could get. Instead, I made the decision to work with very high ISOs (6400-10,000), in order to get fast shutter speeds that didn’t requite me to fully lock the lens on the gimbal. With hindsight, going as far at ISO 10,000 wasn’t necessary. 5000 probably could have done the tricky, but I was very wary that this wouldn’t be happening again for a very long time and I wanted to make sure it wasn’t missed. In order to process such high ISO images, I used Lightroom CC. The colour slider in the noise reduction panel was able to remove some ISO banding from the sky, and the images cleaned up pretty well. I then exported them to Photoshop and ran the Smart Sharpen tool on them. Typically I use Lightroom to sharpen things up, but the Smart Sharpen allows you to target sharpening to specific tonal ranges, so I was able to avoid sharpening the shadows, and hence enhancing any unwanted noise. The great thing about shots like these ones is that they are very sellable shots for publications looking for images of that location. They are rare and unique, and ground the Moon in this specific location. 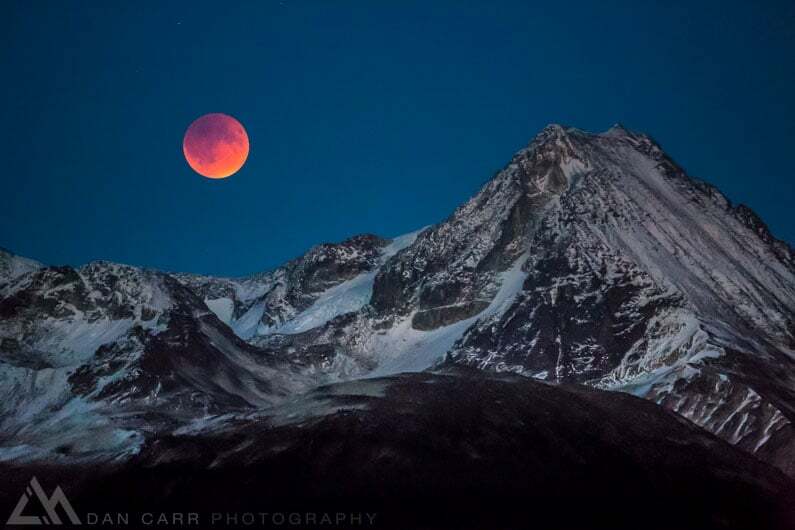 As soon as I posted the first image from this Moon+mountain series to the web, it went viral and was picked up by lots of other sites and even NBC’s primetime national news show! Many millions of people saw the image in just the first day! If you like this image and would like to use it as your wallpaper, all that we ask is that you use the sharing button to share this tutorial with your photog buddies. 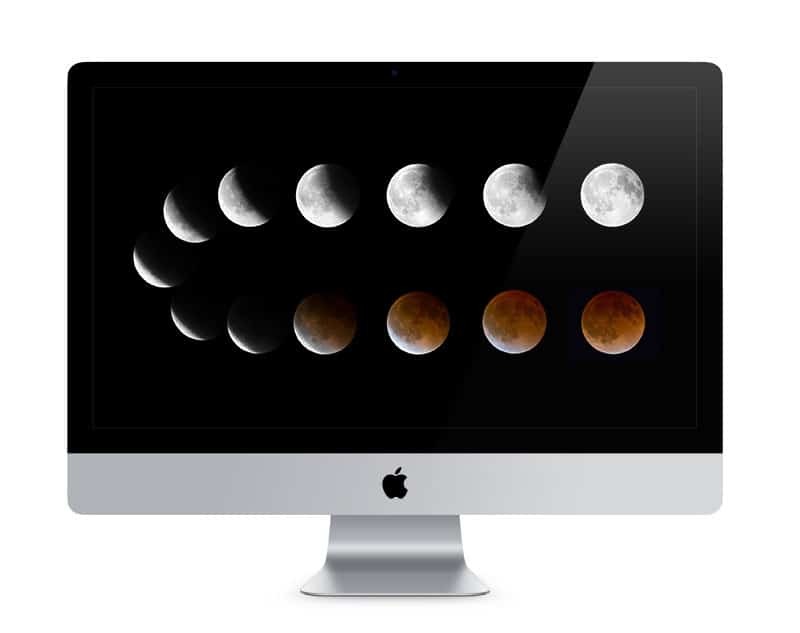 The image is sized very large, to the size of a 27″ iMac screen. Thank you!! Click HERE to download your 2560 x 1440 wallpaper. Let’s see your versions! Leave a comment below with a link to your final image. You’re welcome. How did you get on? You’re welcome! Nice shot mate!